A deputy district attorney with the Nye County District Attorney’s Office has announced his intent to run for a judicial seat as justice of the peace. Deputy District Attorney Nathan Gent is one of three people running for a seat in Pahrump Justice Court in the upcoming election. Gent graduated from University of Nevada, Las Vegas’ William S. Boyd School of Law in 2010. Since then he has worked in both private practice for himself at his own law firm and as a prosecutor with the district attorney’s office. 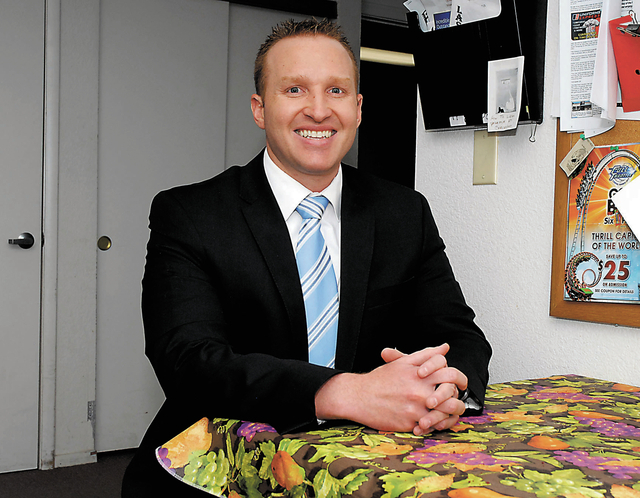 After a short stint as a prosecutor, Gent currently works as a civil attorney for the county, He’s been a resident of the Pahrump area since 2007. Gent said he is running for justice of the peace to further serve the community he’s grown to love. Gent recently sat down with the Pahrump Valley Times to discuss his judicial campaign. Q: What brought you out to Pahrump? A: I’ve actually been a resident of Pahrump since 2007 when I started going to law school. I kept my permanent residence out here in Pahrump, just because I’ve had family that’s lived in the area and I love it out here. Q: How did you end up working for the District Attorney’s Office? A: After I passed the bar, I actually opened my own law firm, the law firm of Nathan L. Gent, PLLC, Professional Limits and Liability Company, and I did that until a position became available at the district attorney’s office. Then I was able to apply and was hired on. I always knew I wanted to be a public servant. Q: You’ve worked in both criminal and civil areas for the DA’s office, do you think that will help you as a justice of the peace? A: Absolutely. As a justice of the peace, you handle both criminal and civil cases, so having that depth of knowledge on both sides, having that experience working on both sides I think definitely helps me to be a more qualified servant of the people. Q: What made you decide this was the time to run for judicial office? A: You know it’s interesting, you have different times of your life, different periods of your life that you’re going through different things, but now is just right for me. I actually just got married three months ago and life is good. I’m just at a place in my life now where I feel comfortable, I have some experience under my belt and I feel like I’m in a position to serve the people of Pahrump well. Q: If elected what are some of your goals you’d like to accomplish? A: I’m a huge believer in service. That’s one thing as a justice of the peace I would definitely stress the importance of. I believe when people commit crimes, they need to pay back society for what they’ve done. A great part of that is in community service. It’s included sometimes, but a lot of times it’s not. I would put a huge emphasis on really making community service a part of people’s sentences if they are found guilty. I think it helps society out and I think it helps the individual out when they’re out there helping the community. A: I believe I am the best person that could serve Pahrump in the capacity of justice of the peace. I think that Pahrump deserves the best and I believe that I am that person. I love Pahrump. I absolutely love being here. I just got married and this is where I want to raise my future family. As justice of the peace, I would be in a unique position where I would be able to help keep Pahrump safe and protect Pahrump for years to come. I think Pahrump really is an amazing place to be. There’s a reason why people have come from all over the United States and even the world to be here. It’s funny because a lot of people come here after they retire, but we don’t have to wait to retire to come here, we can enjoy it now.